Join the discussion on our forums! Come discuss Burgly Bully over in our dedicated Burgly Bully discussion topic. 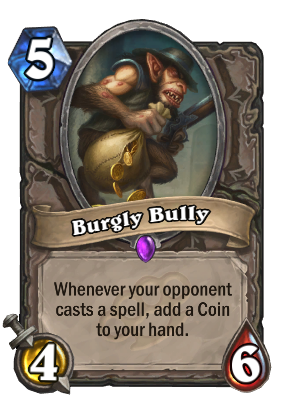 Whenever your opponent casts a spell, add a Coin to your hand. He only burgles to pay the bills. He is really just a bully at heart. Uther of the Ebon Blade + Burgly Bully + Auctionmaster Beardo = Profit! This card is actually based off a custom Hearthstone card I made 1 1/2 years ago before the SoG expansion came out. I'm not even mad, though. Its sort of what I wanted to happen. Its not based off it, It's the exact same concept, companies never take ideas from fans. Pretty cool though, how you made it and it pretty much became a card! Works with the new Time Warp Mage deck! Damn I've never think about that! Which card you replaced with it? His animation is way way too long. Blizzard needs to fix this. Just ok card for priest. This is a terrible card for a Rogue. This card is for more midrange decks that want to protect their strategy in the midgame this card punishes people for having to respond to spells. This guy is more like the new Lotheb as opposed to Tomb Pillager. It doesn't lock them out of the spells it punishes them for having to play them to clear up the board with spell cards. Midrange Hunter and Shaman are the best candidates for this guy. He protects your board from your opponent's spells or at least punishes them for having to play them. If they are forced to use a spell to clear anything you can accelerate your gameplan. Most people will do their best to clear this as efficiently as possible with a spell or just attempt to throw minions at it until it dies all of which work to your benefit. I have several Replays of me winning games because coin hero power or Highmane+ kill command+ hero power plays. wondering if my lock n load/yogg hunter can use this? could really boost lock n load, and 4/6 is a solid body in a deck that runs roughly five non-spell bodies. As long as you get 1 coin from this dude its worth it. 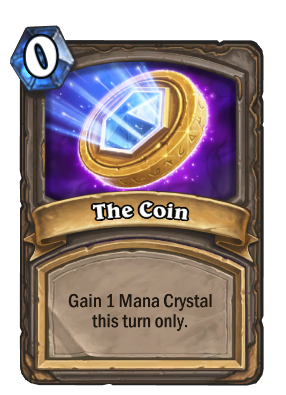 As a Rogue, if this gets you more than one coin and you're already running 2 counterfeit coins in your deck AND tomb pillagers, your Gadgetzan turn is so much more likely to be insane. If this doesn't see play before the rotation because Tomb Pillager is more consistent, I think it'll be an ok replacment for it once the rotation hits after the next expansion. Let's see here...this could be very interesting paired with lore master cho. Just don't play removals. Am I crazy or does this guy look like Daisuke Jigen from Lupin?